Why the Moots Vamoots RSL? I’ve owned a number of titanium and titanium/carbon bikes through the years and we like to have at least one metal bike built up light in the shop. Why? Just to show that carbon isn’t the only game in town and because the acceleration and climbing feel on a light bike (primarily a bike with light wheels…) is simply a lot of fun. Bike riding, no matter how serious you take it, should be fun. However, I found myself in an unusual situation last year as I no longer had a titanium based road bike; I didn’t have a Campagnolo equipped road bike (possibly for the first time in almost 25 years), nor did I have a particularly lightweight road bike. Thus the project wheels started rolling here at Fit Werx to solve all of these deficits in one bike. We had built a few of the previous generation Moots Vamoots RSL for clients and I liked how those bikes came out. So, when the ’16 Moots Vamoots RSL model was announced, and it included items like a 44mm headtube with a new Moots tapered fork and lighter bottom bracket, it was an easy decision as to what titanium frame was going to be used. Use a lifetime capable frameset that could be ridden on pavement, dirt and would hold up well if packed for travel. Titanium. The frame had to be primarily titanium as I already have a nice Parlee Z-Zero carbon, a chromoly steel K.Bedford Customs and an older Cervelo Soloist aluminum bike. Modern features, but with classic “race bike” sentiments. No compromise fit and frame geometry. Improve stability with the light RZR wheels. Every custom bike I have designed for use with this wheelset has been better than the last in this regard. Responsive and snappy climbing without penalizing the rider with a harsh ride. Many bikes do one or the other well, a few do both. Light, but not too light. While it is fun (and possible) to build a 10 lbs bike, it usually doesn’t make a great bike to actually ride. A bike can be too light and the penalty is usually a bouncy sensation on bumpy descents (which can be pretty hair raising) in combination with vague steering and tracking. I wanted none of that; frame integrity was important. Sub 14 lbs complete bike weight. Classic lines. Strong, clean and simple aesthetics. When it comes to ride, I want to get in more miles, but so far this Moots Vamoots RSL has been all that I hoped. End of story. Specs on this ’16 Moots Vamoots RSL are below and an image gallery is near the bottom of the page and if you have questions or want to work with us on a bike, please just reach out. 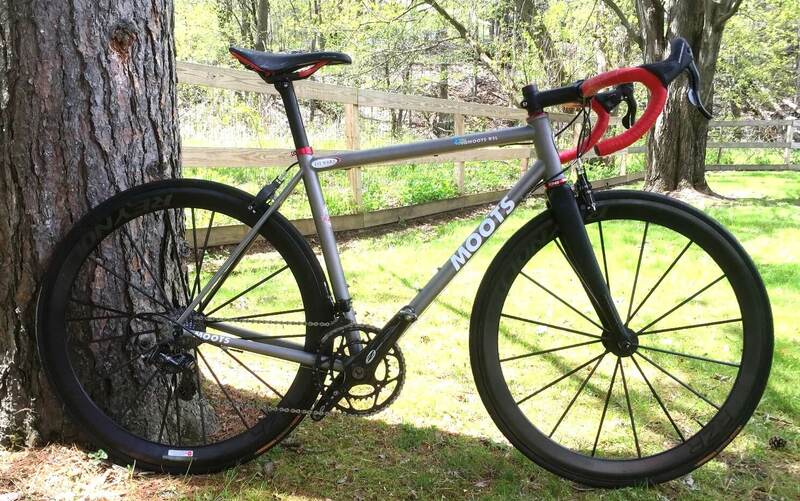 Frameset: ’16 Moots Vamoots RSL w/Moots Carbon Tapered Fork. White/Red outline decals. Red anodizing. Wheelset: Reynolds RZR. I fell in love with this wheel the first time I rode it and I have had a pair ever since. In some ways, it could be argued I built this entire bike around making sure I had a bike that would work great with these wheels. Like some of Lightweight’s models, I can climb a full gear higher with the Reynolds RZR, even compared to most other really high-end wheels, and the way these full carbon wheels are constructed makes them super responsive and comfortable. Tires: Continental GP4000SR tubulars. Not the lightest. Not the smoothest. Not the lowest rolling resistance. Not the most puncture resistant. Not the highest level of grip. Just in the top 20% in all of those categories and thus a great all around tire for my use. Also, the thought that tubulars are really finicky and hard to change went out the window with the advent of tubular rim tape and the vulcanization process used in the construction of the Continental GP4000SR makes it one of the best to tape to a rim. Shift Levers: ’16 Campagnolo Super Record Ergo 11 levers. I’ve always really liked the feel and function of Campagnolo’s Ergo levers. The biggest change with the current generation is that the new front derailleur and Ergo shifter is easier to set-up and shifts notably quicker than past iterations. My only gripe is that Campagnolo left an extra ratchet detent to allow the rider to ride in the small chainring-smallest cog (34-11 in this case) combination without the derailleur cage plate rubbing the chain. 1) Who does this type of cross gearing? If it is you, you should stop. 2) Even if the chain doesn’t rub the derailleur, it usually rubs the chainring pins in this combination. The bottom line is that Campy tried too hard when designing this. The front derailleur and shifter would work even better without this extra click that is pretty much useless. Other than this minor gripe, the new levers have great feel and function really well. I don’t think I’ve ever been able to use Campagnolo and “class leading” front shifting in the same sentence, but I might have to reconsider that after riding this latest Ergo lever and front derailleur combination. Headset: Chris King IS-7. Red. Derailleurs: Campagnolo Super Record. Yes, Chorus costs less and offers similar function, but this bike deserves the best and thus it got it. Cassette: Campagnolo Super Record. 11-25. I ride a cog bigger than 25 on all my other wheels, but I can still getaway with at 25 (without blowing my knees) with the Re ynolds RZR wheels. Yes, Record and Chorus are better values, but the reality is that a bike is made of 25+ parts and if you don’t pay attention to the details, those grams add up to pounds. Chain: Campagnolo Super Record. I had this chain from my last Campagnolo bike and I used it as a nostalgia piece on this bike. Brakes: THM Fibula. Okay, this part is a bit over the top, but it is also very impressive. Most ultralight brakes have poor feel, are flexy, and don’t stay aligned. We have used the THM Fibula before and were very impressed as it is basically Super Record braking power that is significantly lighter. Cables: Cables make a huge difference with how brakes and shifters work and feel. I usually recommend going stiffer than stock on brake housing and, with the THM Fibula brakes, in the rear this meant Jagwire Racer Pro housing from the lever leading to a shorter and more flexible piece of Campagnolo housing on the rear brake (required to allow the THM Fibula to rear brake to center and return properly) and full Jagwire Racer Pro housing on the front. For the derailleurs, even though some would claim sacrilege, I often used to replace Campagnolo’s housing with Shimano as it just seemed to work better. I stuck with Campy this time though. Campagnolo Ultra Deraileur Housing works well and the current high end shift systems have housing and cable that is designed to work as well as possible with it. Skewers: Control Tech. I used to love Control Tech’s hex head skewers in college as they were light, trick and made it that much more difficult for someone to steel my wheels. Besides, I always had an Allen wrench on me, so it didn’t take me much longer to get the wheel off with them either. I was excited when I saw that these were being made again and thus I picked up a pair. I suspect they will also creak less against the laterally stiff and hard titanium Moots rear dropout than a QR skewer. Handlebar: Zipp SL Carbon. I like the shape the bar is light and strong. We sent these out for custom matte black paint so that different parts from different brands would all match. Stem: Zipp SL Carbon. This stem was only around in Zipp’s line for about a year. While I don’t like the reverse mounted face plate bolts, the stem is otherwise a masterpiece of lightweight design and has proven stiff enough for my use. Like the bar, the stem was sent out for black paint to match the fork, post and bars. Seatpost: Enve Carbon. Enve makes good stuff and it matched the geometry and aesthetics of the bike. End of story. Saddle: Fizik Aliante R5. Yes, there are lighter saddles. No, I don’t care. I have not found a more comfortable saddle for my use and I had one with a nice red stripe that would look great on the bike. Pedal: Speedplay Zero Nano. I had a pair from a previous bike and these pedals are functional and light. Speedplay says they require notably more maintenance, but this pair has held up well over the years. Bottle Cage: Not pictured, but Zipp Speed SL are now mounted. 18 grams a cage and they’ve worked well for me in the past. Learn more about Moots here or contact us for more information.